- That's 110% of the difference! Shop with confidence at Triple Crown Products! Ther merchant offering the lower price must have the product currently in stock and available for immediate delivery. The merchant must be an established U.S. site. this Price Guarantee does not apply to auction sites. 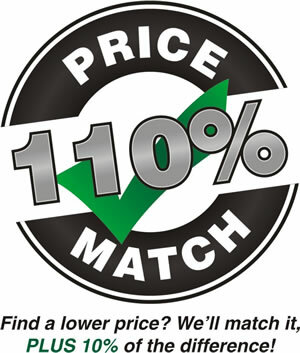 Price Guarantee aplies to price of the item, prior to any shipping charges, handling fees, processing fees, taxes, etc. Claims must be received within 10 days from purchase date. Price Guarantee applies to items for which no other offer, promotion or incentive that may otherwise be provided by Triple Crown Products has been utilized or accepted by customer.